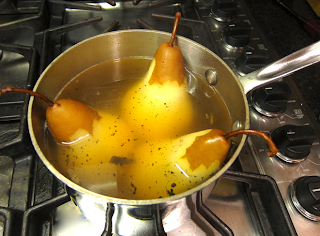 Poaching Pears is a truly elegant preparation that is sure to impress any guest. Our favorite pear variety to poach is the Bosc pear, due to its remarkable aroma and ability to hold its shape after cooking. Spices such as cinnamon and vanilla complement the flavor of this wonderful dish. Enjoy! - 3 Bosc Pears, peeled and cored. 1. In a 2 QT All-Clad Stainless Steel Sauce Pan with Lid, stir together Riesling, sugar, cinnamon sticks, and vanilla bean. Bring to a boil over medium-high heat. 2. Place Pears in Liquid, cover the pan with lid, and reduce heat to a simmer. Simmer pears for about 20 minutes, or until a thinly-bladed knife inserted into the pears meets with little resistance. 3. Allow the pears to cool in their poaching liquid for about 30 minutes. 4. To serve, place 1 pear in each of 4 bowls, and spoon over some of the strained poaching liquid.